Let me start with saying that I have thick, not fine hair that is layered in parts with some natural curl. In the past I have used styling products that were geared for curls. However, I have found that products for volume work even better for someone like myself with some natural curl and wave in their hair to make the most of them. Therefore, I was more than eager to test Samy’s Fat Hair line up of hair care and styling for volume. The Cosmopolitan Beauty Award winning shampoo of 2007 Samy’s Fat Hair Thickening Shampoo and Thickening Conditioner did not disappoint in de-tangling power and to give my hair gloss afterwards without any sulfates. On my slightly damp hair, I went next with Samy’s Fat Hair Amplifying Mousse on the layers around my face and at the ends. This was magnificent for hair structure once I finally used my blow dryer and curling iron. My long bangs are forceful and grow downward, which is constantly challenging. I experimented with the Samy’s Fat Hair Thickening Pomadeand this was a great help keeping those bangs back and toward the side with just a slight feathering effect in the front. I find that spraying a little hair spray after I style my hair with the curling iron or electric rollers help keep my style in place for the next morning. I tried the Samy’s Fat Hair Amplifying Hair Spray and liked that my hair still looked as full of sizeable curls as before I went to bed. The next day I tried the Samy’s Fat Hair Thickening Cream instead of the Amplifying Mousse and it gave me hold, but slightly less volume compared to the mousse. I also decided to give Samy’s Fat Hair Root Lifter Spray the ultimate test on my problem bangs. In my experience, I had not much luck with trying to force my hair upward and back with much success–that is until I played with this particular product. The Fat Hair Root Lifter Spray allowed me to plump up and keep some of my hair back to my surprise. Seriously, my hair is like a river and flows in one direction. Rivers like my hair do not change course. However, this product helped change some of the flow into new hairstyle territory. I know there are people that didn’t care for the Fat Hair line. However, I feel those that would buy a product like this for building volume have fine hair to start. I think there is only so much that products can do for the head of hair that you are born with. What I’m saying is if you tried these products with baby fine hair and were expecting the same thickness of volume that I got then I do not think you will find it. With my type of thick, layered hair that is prone to some curl, these products worked exceptionally well for making most of fullness and hold. I can sincerely say I liked Samy’s Fat Hair line for my type of hair and will continue using these products. 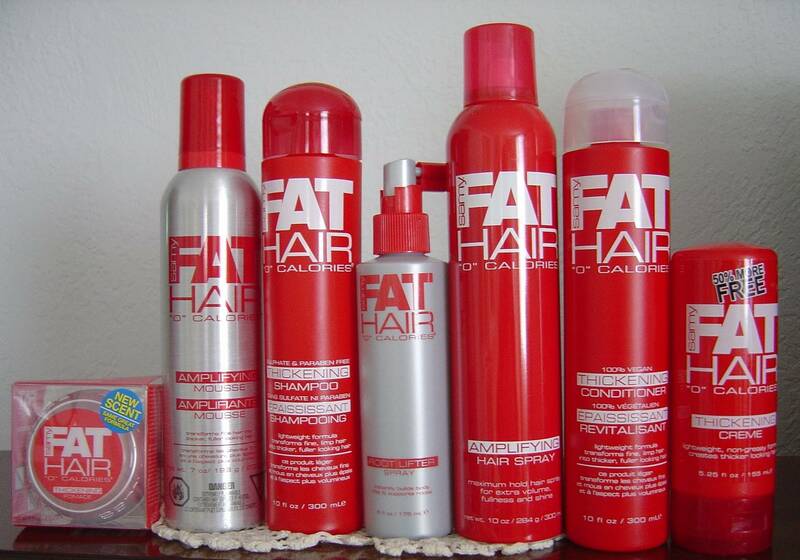 Do try to experiment yourself with some or all of them–and my particular favorite the Fat Hair Amplifying Mousee. You can connect with Samy on their website, facebook, or on Twitter.